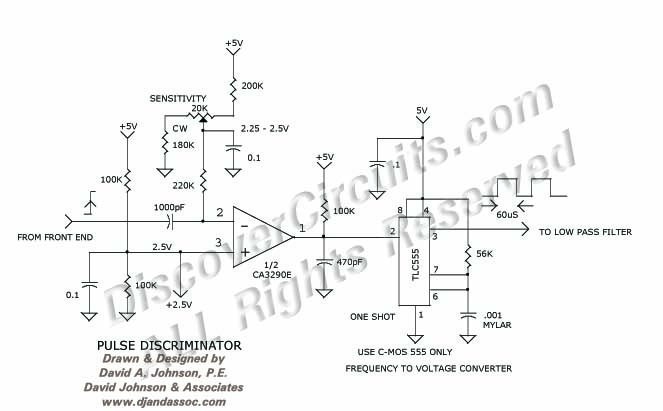 Circuit: 1uS LIGHT PULSE DISCRIMINATOR PLUS F TO V CONVERTER __ Circuit designed by David A. Johnson, P.E. This circuit is designed to detect the narrow 1uS pulses produced by the above Amplifier circuit. The clean logic type pulses produced by the discriminator are then sent to a frequency to voltage converter. The circuit is designed to process a pulse frequency of 10KHz that is frequency modulated by voice audio signals. The circuit is described in more detail in the receiver circuit section of my Handbook of Optical Through the Air Communications.